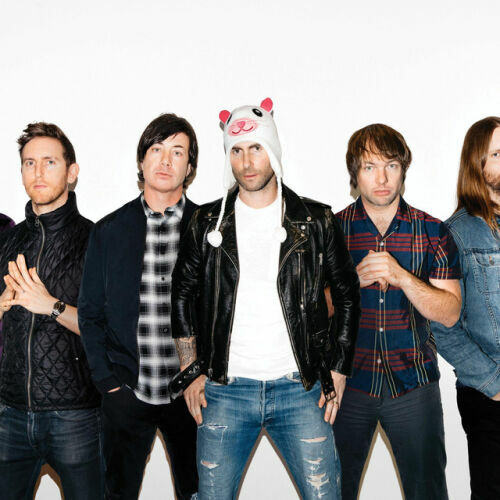 Maroon 5 is an American pop rock band that originated in Los Angeles, California, United States. The group was formed in 1994 as Kara's Flowers while its members were still in high school and originally consisted of Adam Levine (lead vocals, guitar), Jesse Carmichael (guitar, backing vocals) Mickey Madden (bass guitar) and Ryan Dusick (drums). Kara's Flowers signed to Reprise Records and released an album, "The Fourth World", in 1997. After a tepid response to the album, the band parted ways with the record label and the members attended college. Dusick and Madden stayed local at UCLA, while Levine and Carmichael relocated to the east coast to attend Five Towns College. While Levine and Carmichael were in New York, they began to take notice of the urban music surrounding them and later let the style influence the songs they wrote. In 2001, the band regrouped, with guitarist James Valentine added to the line-up, and pursued a new direction under the name: Maroon 5. At this point, Jesse Carmichael switched to playing the keyboards and this has become his main instrument in the band (although he also plays rhythm guitar to this day). After these changes, Maroon 5 signed with Octone Records and released their debut album, "Songs About Jane", in June 2002. The album's lead single "Harder to Breathe", received heavy airplay, which helped the album to debut at number six on the Billboard 200 chart. The band won the Grammy Award for Best New Artist in 2005. For the next few years, the band toured extensively worldwide in support of Songs About Jane and produced two live recordings: 2004's "1.22.03.Acoustic" and 2005's "Live Friday the 13th". In 2006, Ryan Dusick officially left the band after suffering from serious wrist and shoulder injuries and was replaced by Matt Flynn. The band recorded their second album, "It Won't Be Soon Before Long" and released it in May 2007. The album reached number one on the US Billboard 200 chart and the lead single, "Makes Me Wonder", became the band's first number-one song on the Billboard Hot 100. On September 21, 2010, the band released their third studio album entitled "Hands All Over". It was re-released in 2011 to include the single "Moves like Jagger" (featuring Christina Aguilera). While the original version of the album received mixed reviews, "Moves like Jagger" reached the number one position on the Billboard Hot 100 chart. The band released their next album, "Overexposed", on June 26, 2012. All four singles of the album were really successful on the charts - for example, the second single from Overexposed, "One More Night" (released on June 19, 2012), reached number one on the Billboard Hot 100. In 2014, the band signed with Interscope Records and released their fifth studio album, "V", with the very-first line-up of six official band members, as keyboardist and backing vocalist PJ Morton became an official member in 2012. The album debuted at top of the weekly Billboard 200 chart. Since its debut in 2002, the band has sold more than 15 million albums in the United States and over 100 million singles and 27 million albums worldwide.